The men of the 5th Air Base were stationed at Del Monte Field. Their mission was called PLUM (Philippines, Luzon, Mindanao). Stationed on Mindanao, they were to build an airfield for the 7th Bomb Group. By the time these men capitulated to the Japanese on Mother’s Day, May 10, 1042, they had built multiple installations with underground covers to both protect the Allied aircraft and military personnel that were supposed to come to the island. Few made it there. The men of the 5th Air Base fought valiantly against the Japanese, even though their equipment consisted of hand guns, rifles, machine guns and grenades, most of which were World War I vintage, and most being unreliable. In fact, one officer had the men create a tank built from a Caterpiller covered in steel plates. It was called the “Fry Storm”. There were wholes on each end so that machine guns could fire at the oncoming Japanese. It was supposed to be a tank, but as much as the men tried, a tank it could not be. It was slow, difficult to maneuver, and ineffective against the modern-day equipment of the Japanese. The 5th Air Bases were outmanned, outgunned and out fed. Their first camp would be Camp Casising, Malaybalay, Mindanao. The camp was originally built as a training center for the Filipino military police. It was a crude camp, with little electricity, and water was scarce. Approximately 1,000 Americans and 11,000 Filipinos were interned here for a short time. It was said by some of the men that the guards were good and the interpreters fair. The prisoners were able to secure and move their own food and supplies to Casising. That would not be the case once they were moved to the Davao Penal Colony (DePaCol), located on a southern area of Mindanao. 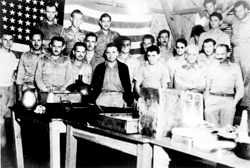 “American prisoners of war celebrate the 4th of July in the Japanese prison camp of Casising in Malaybalay, on Mindanao, P.I. It was against Japanese regulations and discovery would have meant death, but the men celebrated the occasion anyway.” July 4, 1942. NARA photo.